Coming up with a meaningful Bat Mitzvah project is no easy task, especially when it involves 100 girls at a celebration at the Westin Hotel. 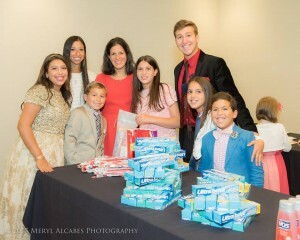 The Bat Mitzvah girl, Beloria, and her parents Miriam and Elie Levy worked with JFS to organize a toiletry drive to benefit the Polack Food Bank. Here’s how it came to life. How did you decide to hold a toiletry drive? Miriam: Last summer, one Shabbat afternoon, we were sitting with friends discussing Bat Mitzvah ideas and someone recommended a volunteer project. We really liked the suggestion and decided to hold a toiletry drive to support JFS. But it wasn’t just about gathering items for clients in need, it was the idea of Beloria and her friends assembling the toiletry bags and making handwritten notes to go inside each bag. It was a meaningful way for our daughter and her friends to help those in our community who may not have resources to get these items. What does participating in this kind of Bat Mitzvah project mean to you? Beloria: We take it for granted that everyone can afford toothpaste, a new toothbrush or shampoo, but not everyone can. This activity was important to me because I wanted to help people, especially those in our community who may not be able to afford these basic Items. How did the guests respond? Miriam: They found it meaningful, and the girls enjoyed making the bags and writing the cards for JFS clients. The parents thought it was a great idea, and we hope to see more B’nai Mitzvah service projects like this in the future. What advice would you have for other families planning a B’nai Mitzvah project? Miriam: The activity made our Bat Mitzvah event more meaningful. Because it took place at the beginning of the evening, it set a nice tone for the night. Guests spoke so highly of JFS and the work they do, it made us feel good about giving back to the community and the partnership. Would you recommend the toiletry drive to other families? Miriam: Yes definitely! I would highly recommend projects benefiting JFS for other B’nai Mitzvah projects. 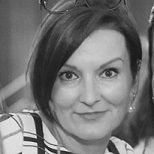 Michelle Shriki is the Director of Annual Giving. She enjoys exercising, listening to live music, fashion and is a freelance makeup artist.